Ukraine is committed to building a modern, entrepreneurial economy of small and medium sized businesses and will never return to a Soviet-style command economy, President Petro Poroshenko said in Davos last week. The official staement concluded a busy week at Ukraine House Davos, where Ukraine's private sector showcased the vibrancy of the country's business environment with panel discussions, cultural events and networking with the world's business elite. "We will stick to the course of the reform, and I as president will do my best to make this progress irreversible," the President said. "We want to build a healthy, Western-style economy, based on small and medium enterprises. We don't want to go back to a Soviet-style economy." 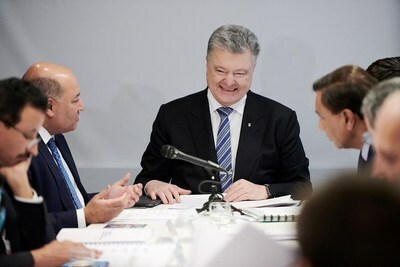 During the week, Ukraine House Davos hosted a closed-door meeting of the National Investment Council of Ukraine led by the President with global CEOs representing over $3 trillion in capital. At this meeting, foreign investors endorsed the government's reform program and committed to further investments in Ukraine, with investment deals worth over $370 million announced. EBRD and Norway's NBT signed a 180 million Euro financing memorandum with NBT announcing plans to invest US$1.5 billion over five years to create 1,000 MW capacity in wind farms in southern Ukraine. This was followed by Horizon Capital announcing their new $200 million equity fund for Ukraine backed by blue-chip investors, which reached their hard cap, far in excess of the $150 million target. "This sends a strong signal to the market that Ukraine is an attractive investment destination," said Lenna Koszarny, founding partner and CEO of Horizon Capital. Joar Viken, CEO of the Oslo-based renewable energy company, said: "We hope what we are doing will open the eyes of other private investors to Ukraine." Roman Waschuk, Canada's Ambassador to Ukraine, said: "Ukraine is leaving the oligarchic, post-Soviet economic space, and is playing by world rules." UkraineInvest, the government's investment promotion agency, hosted a series of panels to discuss global business issues, moderated by UkraineInvest Chairman Daniel Bilak. The panel "Making the Planet Great Again, Charging Ahead with Renewable Energy", sponsored by TIU Canada, addressed the energy transition and the dramatic increase in investment in green power. The "Whose Identity is it Anyway: Privacy in the Digital Age", sponsored by the IT Association of Ukraine, addressed the ethics involved in the use of personal data by governments and corporates worldwide. In the panel "Brains and Grains: Driving the 21st Century Global Economy", sponsored by UFuture Investment Group, panellists analysed the factors driving economic growth including technology, entrepreneurship and creative industries. The UkraineInvest day ended with a fireside chat with Vitaliy Klitschko, Mayor of Kyiv, World Heavyweight Boxing Champion, Co-Founder of Klitschko Foundation, and his brother Volodymyr Klitschko, World Heavyweight Boxing Champion and Co-Founder of Klitschko Foundation. "I am the bodyguard for every investor. For anyone who wants to invest in our home town, I am responsible. Investments are safe because they have Klitschko bodyguards," said the Mayor and former heavyweight boxing champion. Ukraine House Davos also played host to a fashion show by designer Yuliya Magdych, followed by a party sponsored by super-premium vodka brand Zirkova featuring artist Alina Pash and Lviv ethno-jazz band Shockolad. Boho Beautiful, the global yoga sensation who has Ukrainian roots, gave an hour-long wellness class on Friday morning. "It's a huge thing for Ukraine because we have representation of the international scale and the world gets to know more about Ukraine," said Daria Shapovalova, a leader in Ukraine's fashion business and Founder of More Dash. Stakeholders declared Ukraine House Davos an unprecedented success, with more than 1,500 visitors on some days and an estimated total number of visitors in excess of 9,000, much greater than the 5,000 visitors last year.